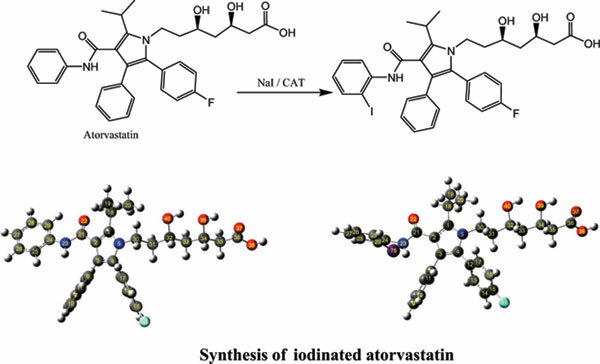 Atorvastatin is an aromatic compound that acts selectively in the liver as an inhibitor of HMG-CoA reductase and cholesterol synthesis. The iodination of aromatic compounds has been widely applied for the preparation of potential pharmaceuticals and bioactive molecules. Herein, an iodinated atorvastatin was synthesized using chloramine- T (CAT) intermediate via an electrophilic substitution reaction. The obtained product was elucidated via elemental analysis, mass spectrometry and 1H-NMR techniques. A comparison of experimental 1H-NMR chemical shifts of the iodinated atorvastatin with the corresponding predicted ones obtained with GIAO method at the B3LYP/LanL2DZ confirmed the desired structure. Furthermore, the favourable electrophilic substitution site was confirmed by the Fukui indices calculations of the heavy atoms of the parent atorvastatin at DFT with the same level of theory. Atorvastatin, iodination, electrophilic substitution, Fukui indices, chloramine-T, GIAO, DFT.